Rating is 4 (based on 83 reviews). Once you log 10 sailing days in your FREE NauticEd Online Logbook, you'll be awarded the NauticEd Qualified Crew Member Sailing Certificate. Alternatively, you can short cut this to 4 sailing days logged by getting Practical Proficiency Training through an acredited Hands-On NauticEd Sailing School. Are you ready to confidently contribute to the operations on a sailboat? Sick of not REALLY understanding? Then let's get started by registering now! Please note: If you're considering doing more than crewing on a sailboat then we recommend that you jump right in and take the Skipper Course instead. If you've still got questions about NauticEd, the courses and/or the sailing certifications, just contact us via email or phone we're happy to help. The Captain has motored your vessel from the slip into open water and is now ready for you to unfurl the sails. The procedures for unfurling sails are reasonably standardized; however, every sailor will, over time, develop their own routine. * Rolled into the mast. There are many opinions as to which is the preferred method, but for now, you will find that each has its pluses and non-pluses. Sailing is rift with opinions that add greatly to the excitement of this sport. 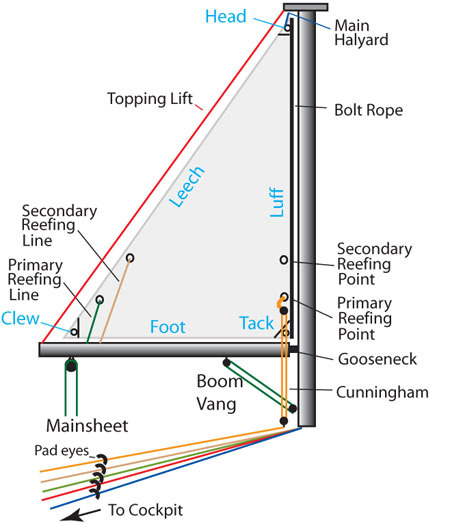 The following diagram is a reminder of the nomenclature of the sails and related thingys. In the video below, you can see two sailboats on a collision course. 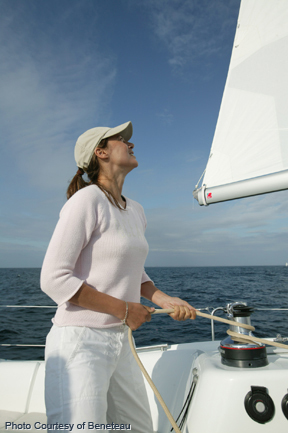 The sailboat on a port tack correctly changes course to avoid the sailboat on a starboard tack. The port tack boat also could have turned to starboard to duck in behind the other boat. However, in this case it chose to tack. The decision to tack or duck is up to you. Which maneuver you perform, tacking or jibing, depends entirely on circumstances. Select carefully. Jibing has more potential for accidents, including equipment failures. The interactive sail trim game "NED" developed by NauticEd, greatly enhances your understanding of the way the sails should interact with the wind and the boat. Spend some time here now playing with NED. The mystery of setting the sails according to the wind will be completely gone after you've played this interactive game. So just how do you tell the wind direction so that you can trim the sails properly? There are 3 ways, the first is very rudimentary but works every time. Simply turn your head until you hear the wind in both ears. Where ever your nose is pointing is the direction the apparent wind is coming from. The second is to look aloft. 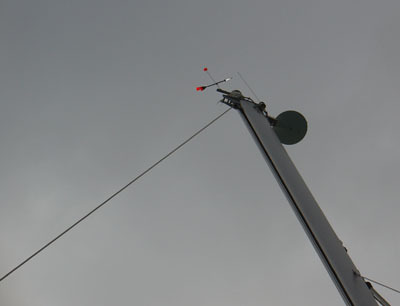 At the top of the mast is usually a wind vane telling us exactly the direction of the apparent wind. The third is a modern electronic method. A wind meter instrument points in the direction of the wind. 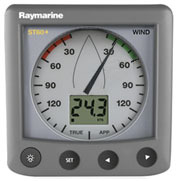 The following are photographs of actual wind meters used on boats. It also gives us the wind velocity. Via the electronics, the meter is able to give us both true and apparent wind directions and velocities. In the first photograph the wind meter indicates that the true wind speed is 24.3 knots and the wind direction is coming from 30 degrees of the starboard bow. The boat then is "on starboard". 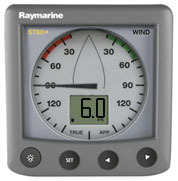 The second meter indicates a true wind speed of 6 knots from 90 degrees off the port bow. The boat is "on port". If these boats were on a collision course, who would give way? Knowing the direction of the wind allows us to know approximately how to set the sails but it is the fine tuning that will get you going your fastest. As explained above, the sail must be operating at its peak efficiency. This is found by letting the sail out until the luff of the sail just begins to fold in or flap and then to take that back out by slightly tightening the sheet. A crew that is vigilantly aware of sail trim and acts accordingly to each wind gust, wind directional change or boat heading changes will win the day and score points with the skipper. 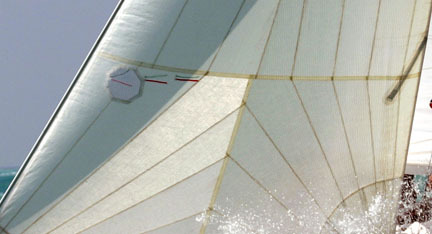 Once a crew member is comfortable setting the sails using the method above, further fine trimming can take place by using the tell tales on the sail. The tell tales on a boat moving 120 degrees off the wind or less should be flowing smoothly on both sides of the sail. Fluttering or back winded tell tales indicate turbulent flow of air on that side of the sail. Thus, pull the sail sheets in or let them out accordingly. If the INNER tell tales are fluttering pull the sheet IN. If the OUTER tell tales are fluttering, let the sheet OUT. The most professionally organized sailing training I've seen. The adaptation of combining e-learning with a practical experience based sailing certification is impressive. Well done!